Look, if you don’t know the life story of John Stith Pemberton, it’s got a lot of ups and downs. He was a medical doctor and chemist, and he served as a Lt. Colonel in the Third Cavalry Batallion of the Georgia State Guard during the American Civil War. In April of 1865, just as the War was coming to a close, he suffered a saber wound to his chest at the Battle of Columbus and as a result of that wound and the medicine used to treat his pain, he developed an addiction to morphine. He would spend the rest of his life attempting to kick that habit, but he wouldn’t ultimately succeed before his death from stomach cancer in August of 1888. But he did attempt to kick his morphine addiction, and in the process, ultimately invented the most famous soft drink in the world. Coca-Cola. And yes, he did use coca plant extract in his original formulas for the beverage. Now, minus that very expensive and quite illegal throughout the United States coca leaves, you can learn how to make your own version of the 1886 formula for Coca-Cola developed by Dr. Pemberton. Now, again, there’s no coca leaves in this — they’re both intensely illegal in the United States and also would make this drink even more terrifying. Even without cocaine involved in its production, it contains close to five times the caffeine one would get in a modern Coca-Cola and an absolutely terrifying amount of sugar, as well as quite a bit of hard liquor. It must be stated that this recipe is not anything like any version of Coke you will have ever drunk in your life, unless you’re Keanu Reeves and thus are an ageless immortal being who was there in the 1880’s when this version of Pemberton’s famous drink was created. 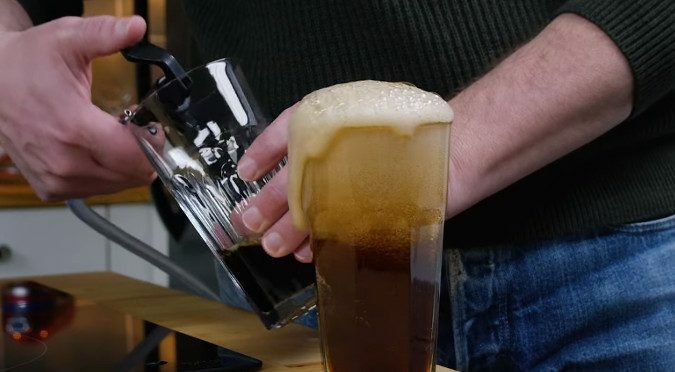 It’s really interesting to watch them put this together and actually drink it — from what they say on the show (Glen and Friends Cooking) it’s extremely sweet, much less biting than modern Coke and has a strong lime flavor to it. I was amazed to see him make it with basically Everclear, 75% alcohol/151 proof, as I always thought the 1886 recipe was created in response to temperance laws in Georgia at that time. But considering the alcohol is only used in conjunction with essential oils to create a flavoring base and very, very little of it gets used in the soda itself, I can see how that worked out. It’s really interesting to see people do this kind of almost-archaeology with food, especially something as widespread and prevalent as Coca-Cola has become today. There are also videos about making butter tarts from a 1900’s recipe, butterscotch cookies from 1938, and how to make your own chocolate chip cookie recipe, if you want to dive into more historical cooking.